The next session of classes extends from April 1, 2019 through June 21, 2019. To see the times and days of the week for each class go to the Store . You may join a class at any time; please contact Monica to receive a prorated price. and a loose-fitting top. A good pair of athletic shoes is important. Please bring your own mat. Weights and risers will be provided. Can I start in the middle of a session? Yes, contact the instructor through the Contacts page and she will calculate a prorated amount for your cost. No, the exercises can be modified in difficulty. Please do not hesitate to contact your medical provider if you have any doubts about your ability to take this class. A variety of routines (and music) are used in the class. Weights are often used in conjunction with risers. 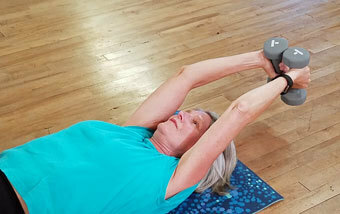 Exercises with weights include the military press, the triceps curl, and the kickback, along with many others. 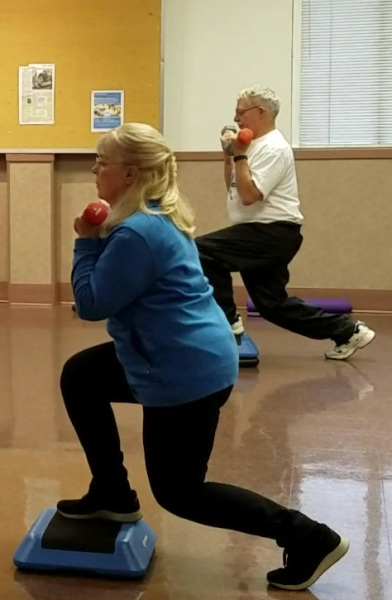 Varied stepping and balance exercises are done with both the use of risers and without. Core work is done on a mat, sometimes with weights. Exercises on the mat include push-ups, planks, and a series of ab exercises.